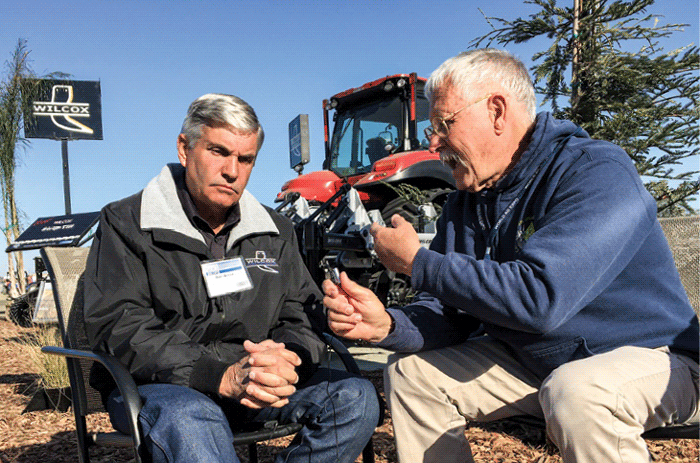 Alan Wilcox of Wilcox Agri-Products and UC Cooperative Extension specialist Jeff Mitchell debated the challenges and opportunities for increased implementation of conservation tillage practices on California farms during the World Ag Expo in February, reported Alan Stenum in Farm Equipment magazine. Wilcox said farmers are going to be resistant to anything they suspect will affect yield. Mitchell said creative innovation underway will have a big impact on some of the more challenging crops that are grown in California. "This is a region where costs are high. The cost of doing business is high, and maximum yields on any crop are important to even break even," Wilcox said. "We're going to be intensely committed to water management and the maximum amount of water." Mitchell said farmers in other parts of the U.S. started to switch to reduced disturbance no-till systems to conserve water. "The recognition of the value of that opportunity to reduce soil water evaporation and have more water going through the crops through transpiration hasn't really sunk in here in California in large fashion," Mitchell said. While Mitchell noted that water is essential to the discussion of conservation agriculture, there are other important aspects to consider. "Biological cycling of nutrients in the soil, tightening up the system so there are fewer losses, either to the groundwater as some sort of pollution, or improving the overall soil function and nutrition provision capacity of the soil - that's not a small aspect of the overall system, nor are the opportunities for reducing costs," Mitchell said. Wilcox said he would characterize the argument differently. "The point is in all of our tillage strategies - and in every situation - we never compromise yield," he said. Read the complete debate in Farm Equipment magazine. More information about the use of conservation agriculture practices can be found on the UC Conservation Agriculture Systems Innovation website. In California, 40 percent of agriculture is still irrigated by pouring water onto farmland, a much less efficient practice that drip and overhead irrigation. But those numbers are changing, reported Matt Weiser on Water Deeply. Weiser interviewed UC Cooperative Extension cropping systems specialist Jeff Mitchell about the water-saving potential of using overhead irrigation, a system that is popular in other parts of the nation and world, but only used on 2 percent of California farmland. Mitchell was the primary author of a research article in the current issue of California Agriculture journal, which said that water and money can be saved using overhead irrigation in production of wheat, corn, cotton, onion and broccoli. Mitchell said California researchers are looking more closely at overhead irrigation because they anticipate future constraints on agriculture, including water and labor shortages. Additionally, the system is ideal for combining with conservation agriculture systems, which include the use of cover crops, leaving crop residue on the soil surface and reducing tillage disturbance of the soil. The combination of overhead irrigation and conservation agriculture practices reduces water use, cuts back on dust emissions, increases yield and improves the soil. 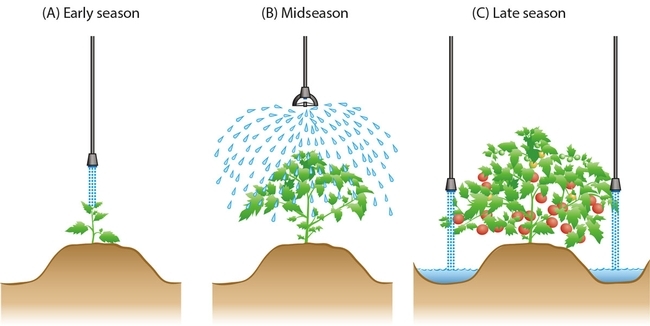 Weisner asked how overhead irrigation could be as efficient as drip, when people typically see "water spraying everywhere from these roving sprinklers high off the ground." Mitchell said farmers use pressure regulators and a variety of nozzles on hoses hanging down from the system to deliver water at precisely the rate and location where it is needed through the season. "So, they're not spraying water. These are low to the ground, and there are various delivery nozzle practices that can be used," Mitchell said. A cover crop growing in cotton and tomato residues in a no-till agricultural field. 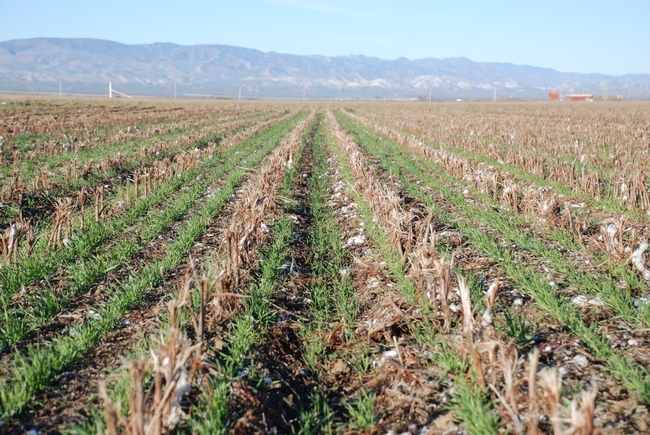 Despite the many benefits of no-till agriculture - including water conservation, improved soil health and reduced dust - the concept is still a "hard sell" in California, reported Ken James in Comstock's Magazine. The article featured a number of California farmers who sang the praises of the no-till farming method. UC Agriculture and Natural Resources (UC ANR) conservation agriculture expert Jeff Mitchell said the slow implementation of no-till in California is "largely a matter of our farmers not being familiar with no-till practices." Tillage became popular in California in the 1930s. The agricultural systems developed in the state were wildly successful. "Because they worked so well, and were so profitable, nobody has felt they should make a change," said Mitchell, who is a UC ANR Cooperative Extension specialist based at the UC Kearney Agricultural Research and Extension Center. Mitchell is chair of the Conservation Agriculture Systems Innovation Center, a group of farmers, researchers, USDA scientists and ag industry professionals who are working together to spread the word about and encourage adoption of no-till production. Key CASI messages were shared in the Comstock article. “Since water does not evaporate as quickly in no-till fields, savings in water cost are easy to determine,” Mitchell said. “In addition, fewer pesticides are often needed and farmers also save money by the diminished need to buy the expensive tilling equipment and to pay people to run them.” He adds that soil in the fields, no longer exposed by the tilling, remains richer in its biodiversity and can sustain higher yields. Compaction of the soils, caused by the heavy tilling equipment, is reduced. Jeff Mitchell, left, presents research results at a UC ANR West Side Research and Extension Center field day. Reporter Dennis Taylor of the Visalia Times-Delta wrote about research results recently published by UC Agriculture and Natural Resources scientists that may allow farmers to be part of carbon cap-and-trade agreements. Taylor interviewed lead researcher Jeff Mitchell, UC ANR Cooperative Extension specialist and chair of the UC ANR Conservation Agriculture Systems Innovation Center. Long-term research by UC ANR has documented the capacity for farmland in the San Joaquin Valley managed with certain conservation practices to sequester carbon, results that could give farmers a seat at the carbon trading table, the article said. The study was published this month in the Agronomy Journal. "We're reducing the atmospheric load of carbon dioxide, a greenhouse gas that plays an important role in global warming," Mitchell said. "Proving a stable storage location for carbon could allow agriculture to be part of future cap-and-trade programs." The ANR news release on the research was also picked up by the Central Valley Business Times, California Political Review and the Red Bluff Daily News. Click here to listen to Doug Cooper of AgLife radio interview Mitchell about the research. Jeff Mitchell, left, at a conservation agriculture field day. The untiring leader of the UC Conservation Agriculture Systems Innovation Center, Jeff Mitchell, was compared to the legendary American farming pioneer Johnny Appleseed by the author of The Grist's Thought for Food blog, Nathanael Johnson. Mitchell, UC Cooperative Extension specialist in the Department of Plant Sciences at UC Davis, took Johnson to research fields and farms to show progress being made toward more sustainable production practices in California row-crop farming. 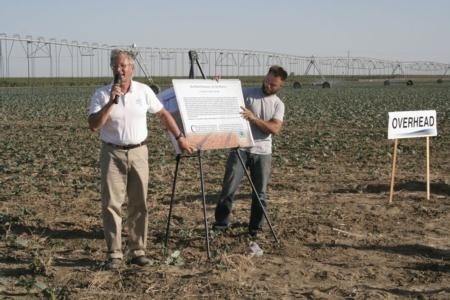 Johnson turned the visit into a 1,300-word feature that included links to conservation agriculture research Mitchell has published in California Agriculture journal. As the years passed, the soil improved. Instead of the farm equipment needing to break up clots of compacted soil, the researchers found they were planting into soft, fine-grained earth, continuously tilled by worms and roots and microorganisms. Mitchell learned that residues and no-till practices can reduce irrigation water needs by 16 percent, as well as cut down dust emissions and store extra carbon in the soil.